Add this to the top of your must try list. 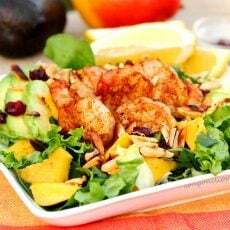 This salad has it all…spicy, tart and sweet flavors, crispy and soft textures, fresh ingredients and beautiful colors. The shrimp is actually made with large peeled and deveined cooked shrimp so all that’s needed is a quick sauté in olive oil, lemon juice, chili powder, granulated garlic, salt and pepper. 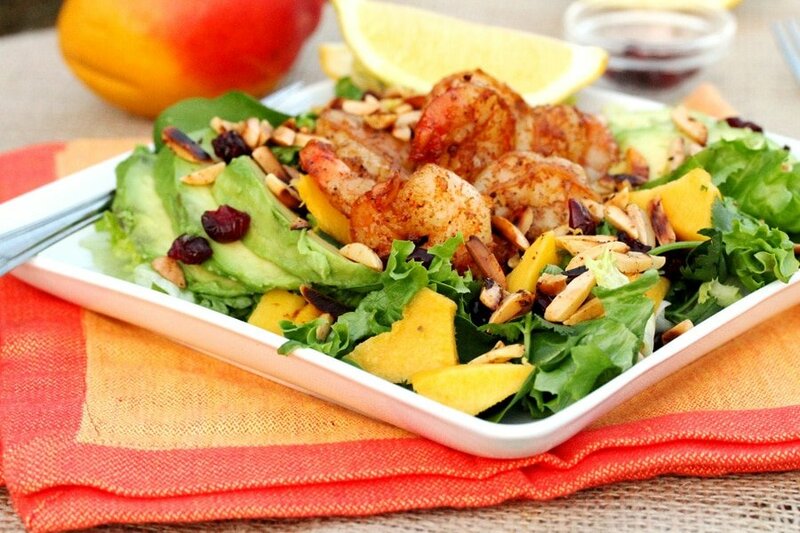 I especially like how the toasted almonds taste in this salad along with the sweet tartness of dried cranberries and mango. In this recipe “Tommy Atkins” mangos are used. These are the ones that are red with green and bright orange, or yellow accents. 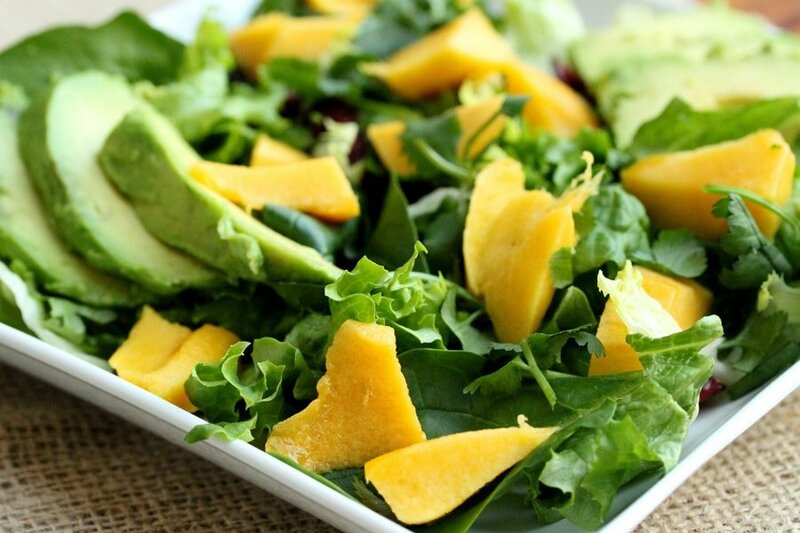 Also, yellow mangos called “Honey (Ataulfo)” mangos (kidney shaped) would taste delicious in this salad. 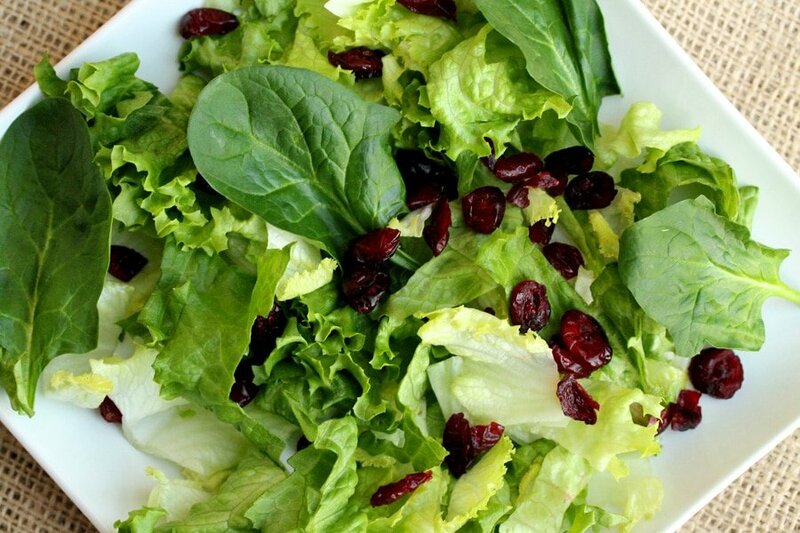 This scrumptious salad can be served as an appetizer, side dish or main dish. Just top with your favorite dressing and it’s time to eat. 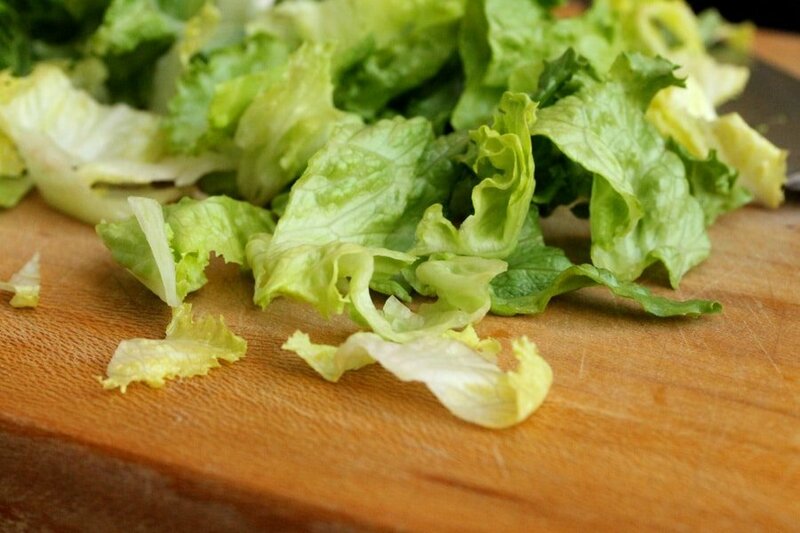 Cut the lettuce into fairly large pieces. Add the lettuce and spinach leaves to the serving plates. If the spinach leaves are large they may need to be cut and half or in quarters. 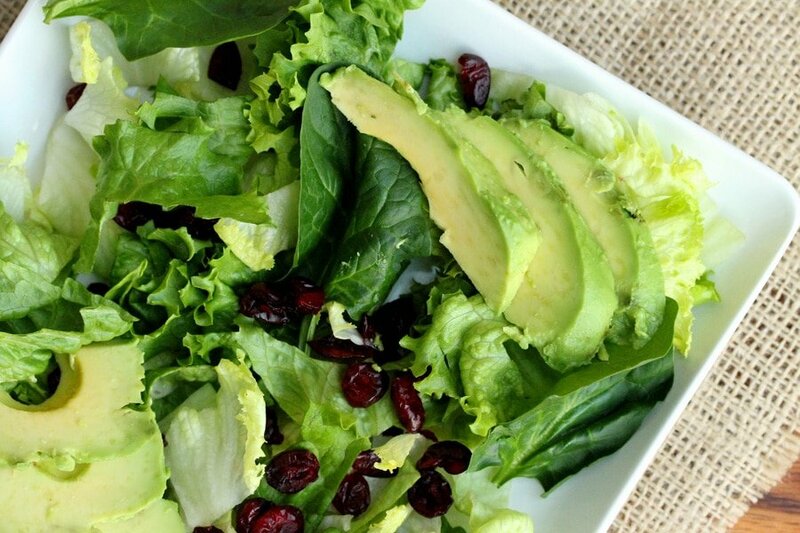 Top the greens with dried cranberries, sliced avocado, chopped cilantro and mango. …chili powder, lemon juice, pepper and salt. 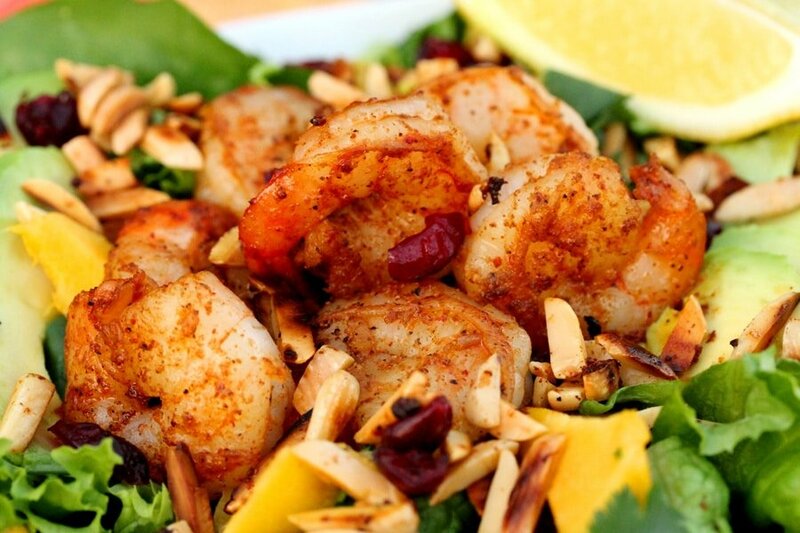 Stir together to coat the shrimp with the spices. Turn the shrimp over and stir so that each side turns a light golden color. 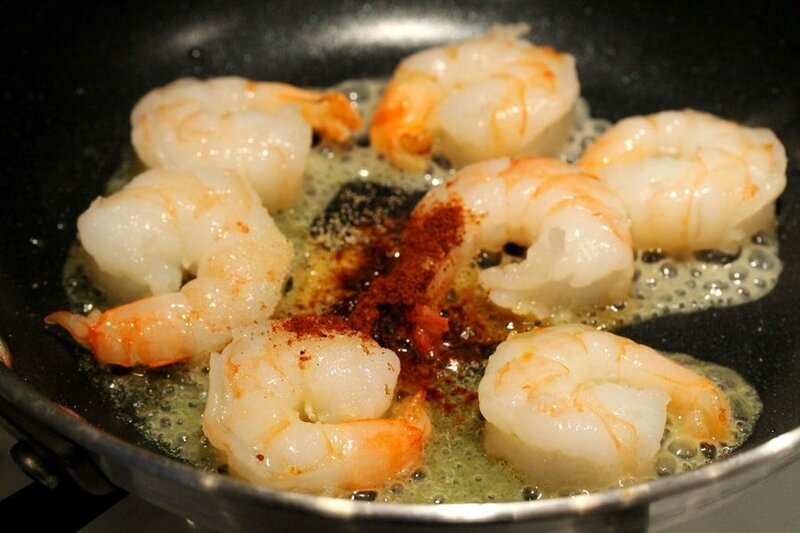 Continue stirring until all sides of the shrimp have a light golden crust (about 4 minutes). 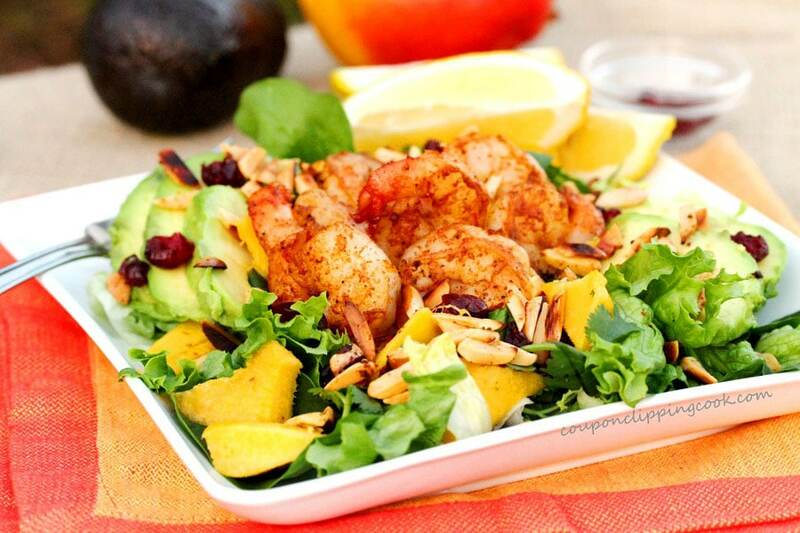 Transfer the shrimp to a bowl or plate and set aside to cool. 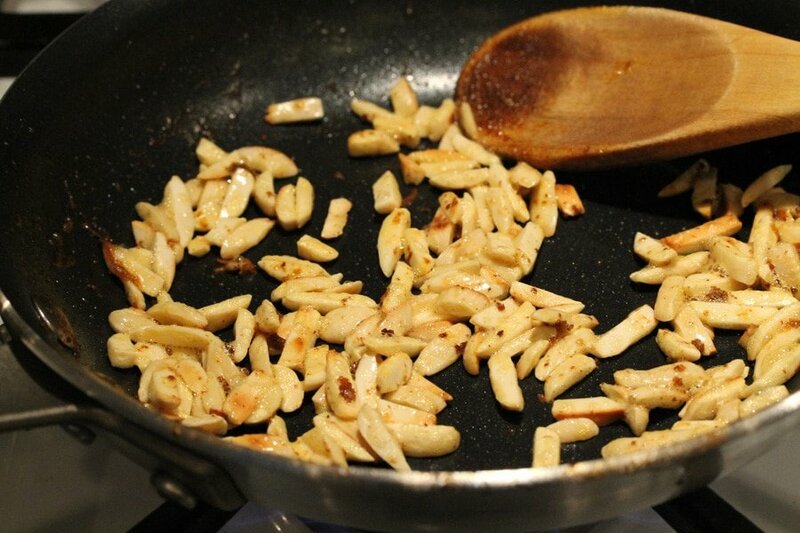 To a small skillet add the slivered almonds. Turn the heat on to low. 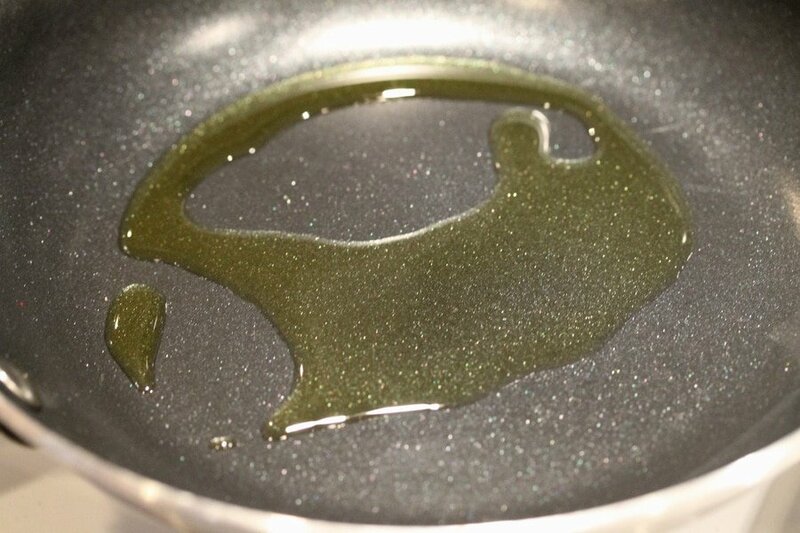 I actually used the same skillet as the shrimp was cooked in. 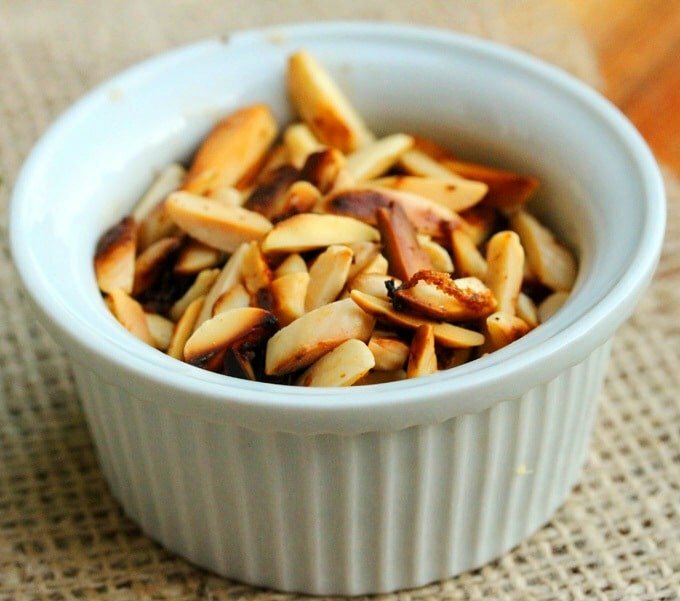 Continuously stir the almonds until the sides start to turn slightly brown (about 2 minutes). Transfer the almonds to a small bowl. The almonds get really hot so take care not to handle them until they cool off a bit. 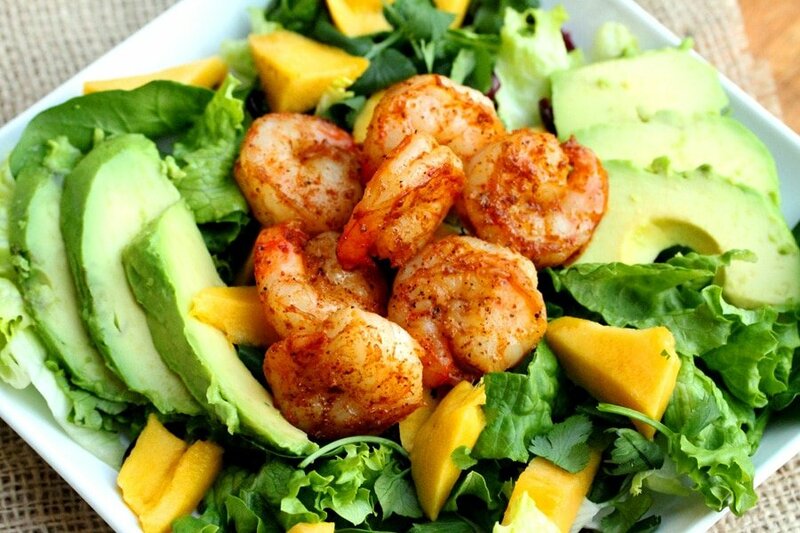 Add the shrimp on top of the salad. Garnish with more dried cranberries. 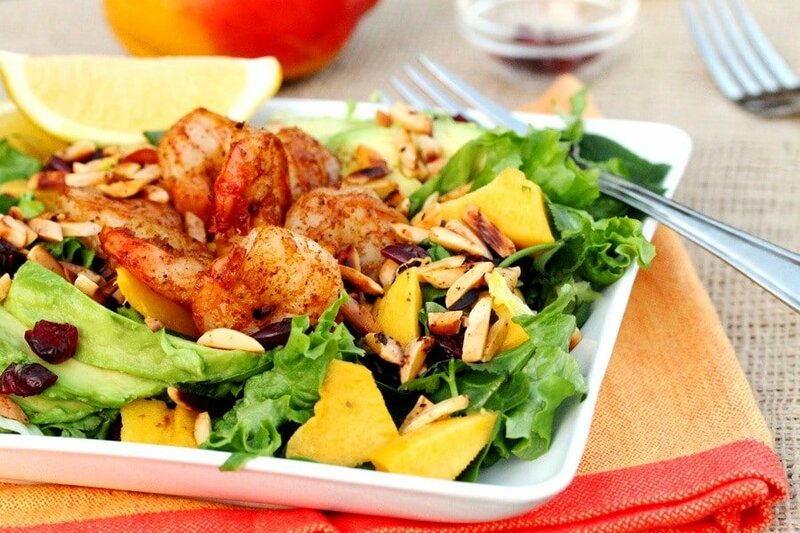 Then top the salad with toasted almonds. 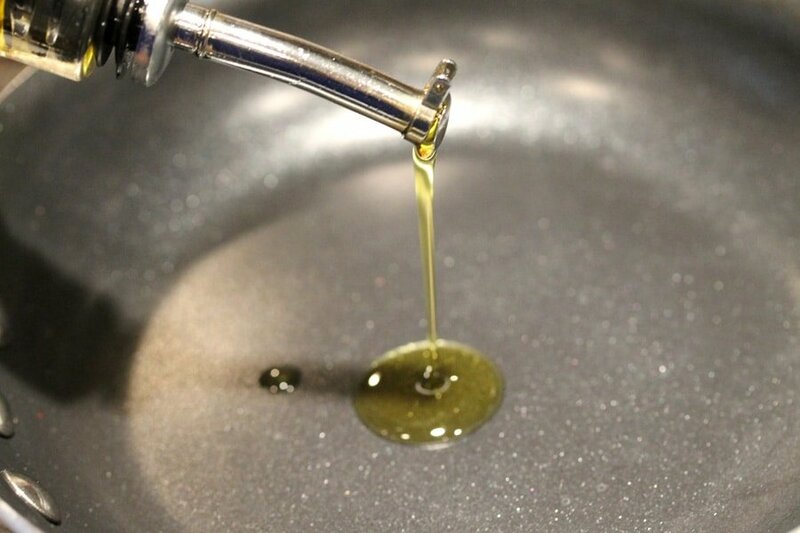 Serve with a drizzle of your favorite dressing. 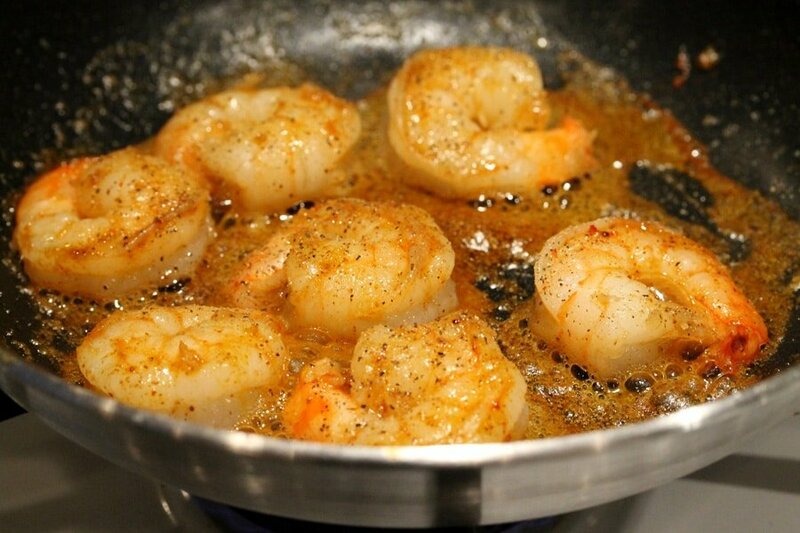 To the pan add cooked shrimp, granulated garlic, chili powder, lemon juice, pepper, and salt. 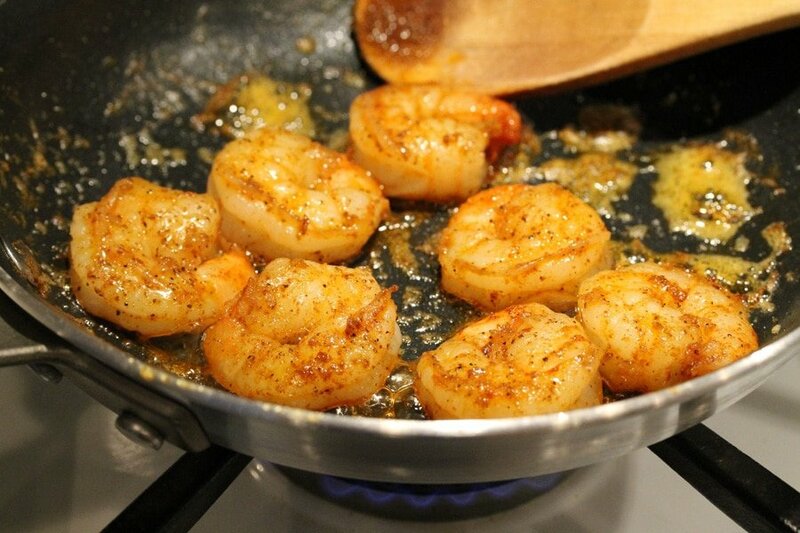 Stir together to coat the shrimp with the spices. 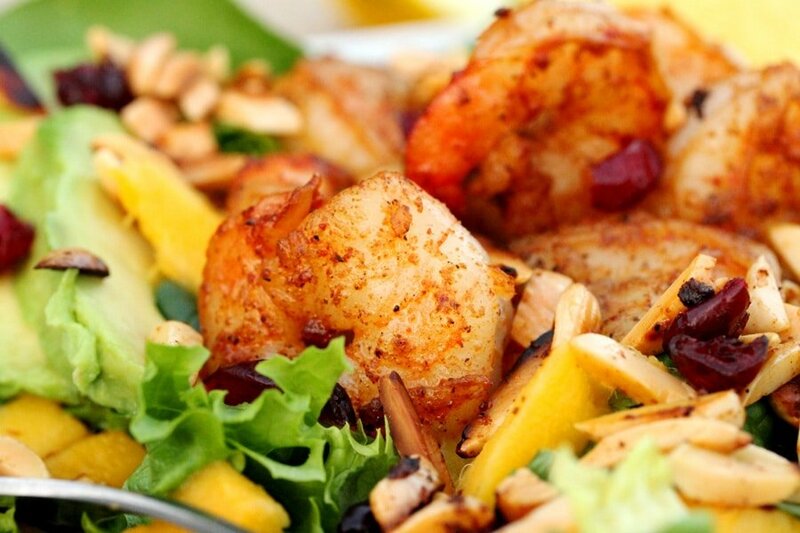 Turn the shrimp over and stir so that each side turns a light golden color. 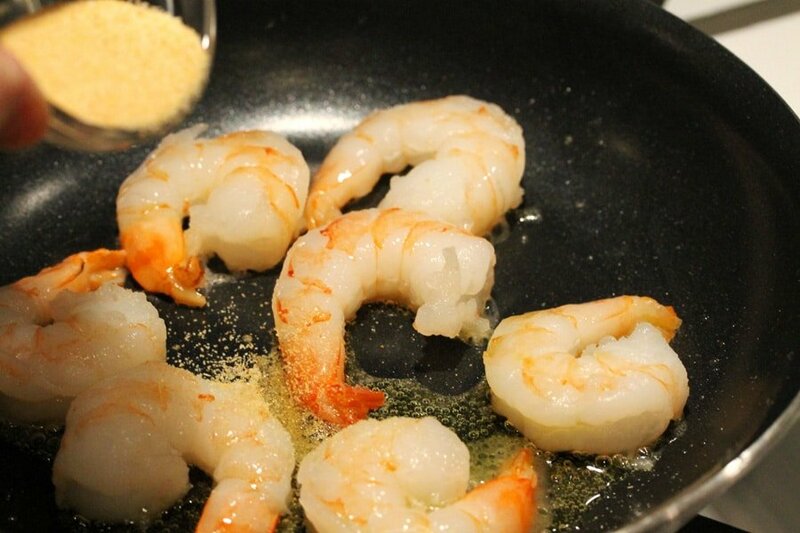 Continue stirring until all sides of the shrimp have a light golden crust (about 4 minutes). To a small skillet add the slivered almonds. Turn the heat on to low. 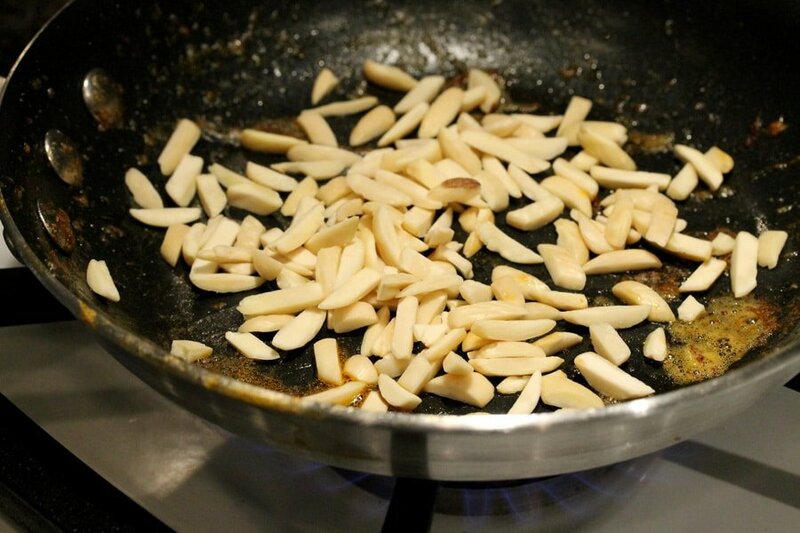 Continuously stir the almonds until the sides start to turn slightly brown (about 2 minutes). Transfer the almonds to a small bowl. The almonds get really hot so take care not to handle them until they cool off a bit. Set aside. 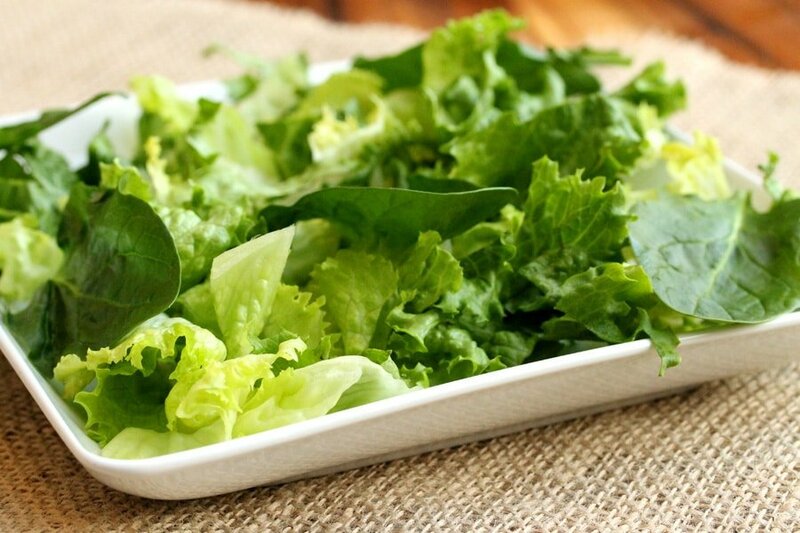 Divide the lettuce and spinach into equal portions and add them to the serving plates. If the spinach leaves are large they may need to be cut and half or in quarters. Next, add the rest of the dried cranberries and top with the toasted almonds. what type of dressing could you use? 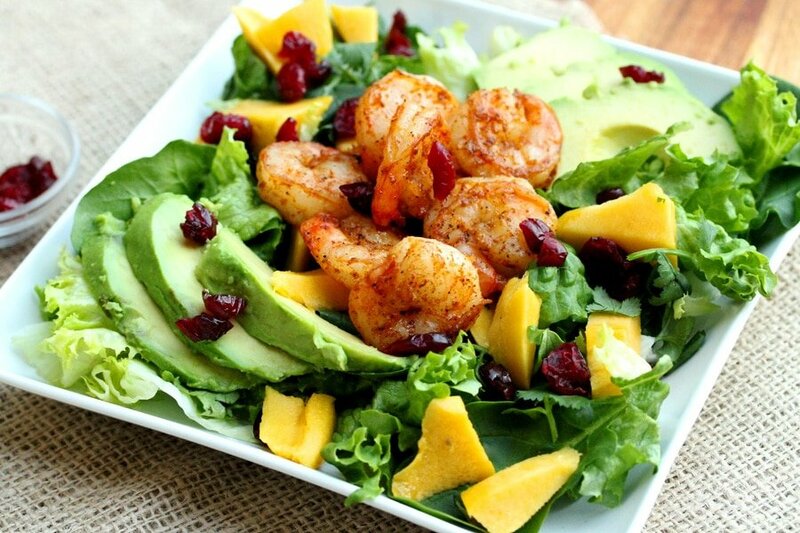 Hi Yvette, a light balsamic vinegar dressing goes nicely with the shrimp and the mango. I’ve also been known to drizzle some good old French dressing on it. Thank you for stopping by! This is my all-time favorite salad. I’ve made it for people and they’ve proclaimed that they’d order this in a restaurant… it’s that good. I’ve yet to make it with the cranberries though…. i have this problem where all dried cranberries “disappear” on their way home. do they really add to the salad, other than color? sort of seems like they’d be overkill since you are already getting sweetness from the mango, no? Hi Kathy, I know what you mean about the cranberries disappearing on their way home. That happens to me too! You’re right, the main reason I added the cranberries was the color. The sweetness of the cranberries is so similar to the mango that I’m sure they wouldn’t even be missed for the taste. So glad you liked the salad. Have a great day. 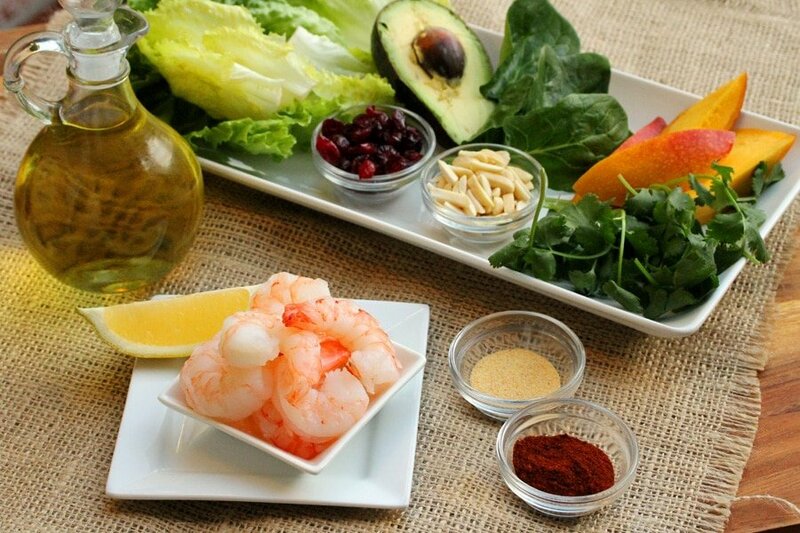 Delicious blend of ingredients and flavors here. 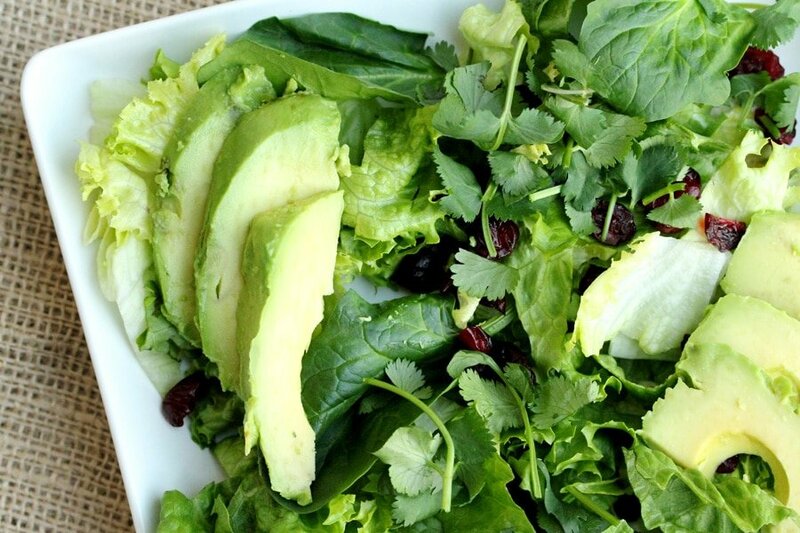 Every component of this salad I like, so I am saving this recipe. Vibrant, fresh and healthy-well done. Your pictures really won me over! Have a great day! Hi Tina, thank you…so glad you like it. Have a great day too!